When some children play, they play hard! And when kids play hard, it can often lead to falls and broken bones. Fractures (or broken bones), we all remember, are very common during childhood. In fact, fractures are the fourth most common injury among children under age six, and falls cause the majority of the fractures in this age group. Most fractures affect the upper extremities: the forearm, wrist, and above the elbow. This is a result of the natural reflex that occurs when a fall happens – when falling, people typically throw their hands out in an attempt to stop the fall, and that leads to injuries on these parts of the body. 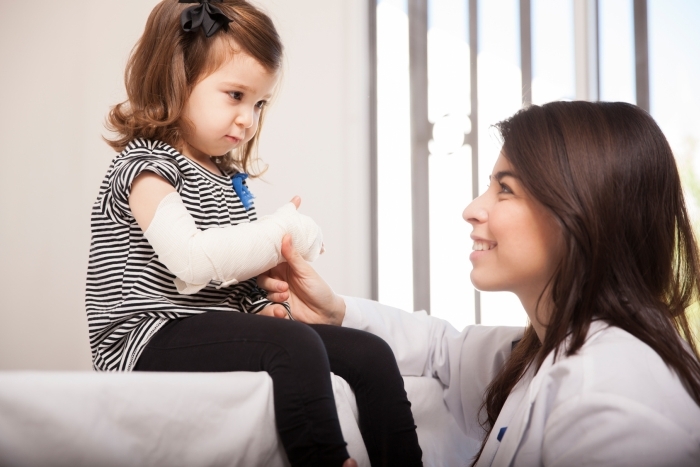 Despite the frequency of broken bones among children, many parents, guardians, and children themselves naturally become quite anxious when a broken bone occurs. The first step in dealing with the anxiety is making sure the bone is actually broken. This can sometimes be difficult, especially amongst younger children who can’t yet accurately verbalize what they are feeling or experiencing. Typically, when a fracture has occurred you’ll see swelling and your child will clearly be in pain. They may also say they heard a snap or a grinding noise during the injury. The suspected area of the body may look deformed. Finally, they will often be unwilling, or unable, to move the injured limb. This doesn’t mean, however, that your child’s ability to move the bone means there can’t be a fracture. Also keep in mind that when a break is non-displaced, that is when the pieces on either side are straight in line with one another, it may be harder to tell if there is a fracture.